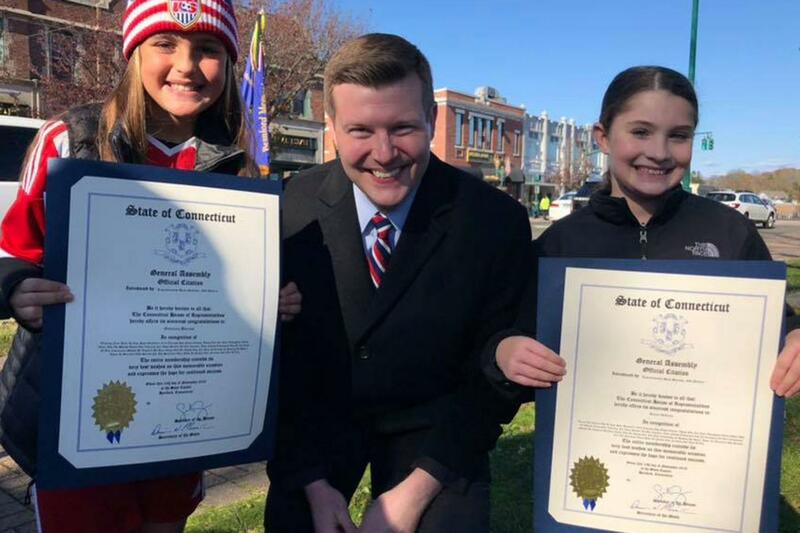 This year's Veterans Day essay contest winners were Adams Middle School students Sara Iglesias and Kat Bassegio from Guilford and Walsh Intermediate School students Giuliana Barros and Giana DeCarlo from Branford. 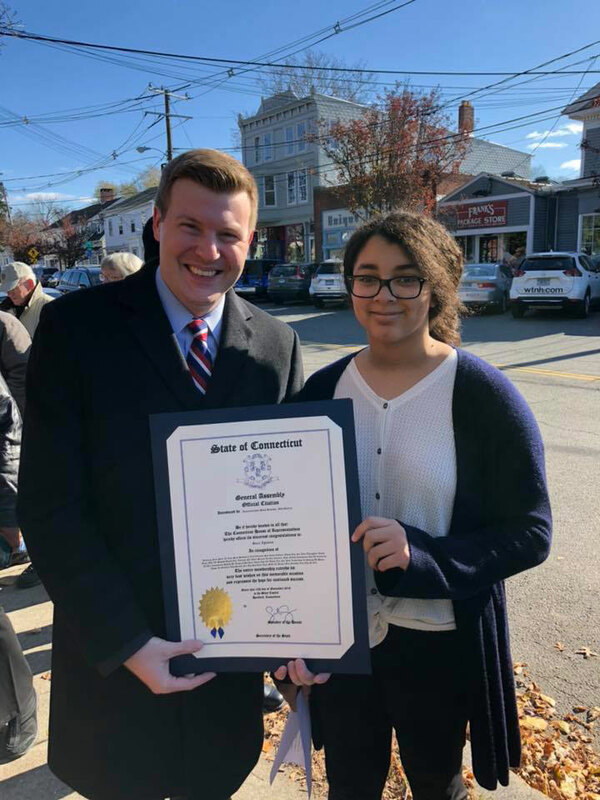 In addition to receiving a citation from Rep. Scanlon, each of the winners had the opportunity to read their award-winning essays at each town's Veterans Day ceremonies. Most people know what a veteran is, but not everyone understands what makes veterans who they are. The simple answer is someone who has served in the military. But a veteran is so much more than that. A veteran is someone who has pledged their love and service to this country. No matter what field they served in for the military, or what job they did, the United States would not be the amazing place that it is without those who have served and continue to serve this country. We should thank veterans for helping to make America the amazing place that it is. Although Veterans Day ensures that we all have the opportunity thank our veterans, many people forget the sacrifices made and risks taken in order to serve in the military. In other words, many people don’t know what we are thanking veterans for. Anyone who joins the military has to give up something. In order to serve, they have to leave their families for very long periods at a time. Those going to fight in wars or battle are doing so knowing that they may not make it out alive. The selflessness in dedicating so much of their time to fight for millions of people they don’t even know is unexplainable. It is so important that all veterans understand how grateful we are for the virtuous acts they’ve performed over the years. A few years ago, if anyone had asked me why we should thank veterans, I may not have been able to give them a good and genuine answer. I didn’t always understand the important contributions all veterans have made for America. But now, I don’t believe there is any way that is good enough to express the pure gratitude I hold in my heart for all veterans. The is no way to show them how thankful I am for giving me an incredible country to live in, for giving up so much time with their loved ones, and even risking their lives. The very least that any of us can do is thank them, and that’s why we must do so when given the chance. It is so important that we thank veterans to honor them, as they have brought honor to this country. The sun shining through your bedroom window in the morning. Riding the bus to school and talking with your friends. Going to class and learning new and valuable information. Freedom comes in all shapes and forms here in America. But imagine that the freedom that we take for granted is suddenly ripped from our grasp. We, as middle school students, don’t imagine a life like this because we have the reassurance that we are safe and that our freedom is safe in the United States. We have freedom not only because it’s a part of our foundation as a country, but because brave men and women have defended, protected, and fought for our country in the honor and in the name of us all for many years. Veteran’s Day is a holiday meant to represent and thank veterans for all they have done. But we can never truly repay or honor them for the amount of effort, time, and pain they have put into our country. Veterans are the reason that we are all here today. They are the reason I’m able to leave my house, come here, and say these words. The fact that these amazing people only get one day of recognition shocks me because they deserve every day of the year to be thanked and appreciated. Veterans have helped us every step of our entire lives, and we haven’t even met half of them. They have accomplished and completed astonishing actions in order for each and every one of you keep and maintain your freedom. Some of you walked your dog or practiced with your team yesterday. Others spent time with their family or did their chores around the house. Veterans have given up this life, this gift, to protect our’s. It’s a privilege to be able to be here with all of you. So, of course we should thank veterans. They’re the reason we can thank anybody at all. Imagine fighting in a war and thinking that you might not make it out safe. Imagine every day going to work and thinking that you might not be alive at the end of the day or thinking that you could get wounded or injured. That's what the brave men and women in our military do for us every day. Think about being in a war and being terrified. Think about not having any good food or not having a comfortable bed, missing holidays or giving up your birthday or just overall missing your family and friends. Well even though people in any branch of the military will get scared at time and go through all of the things I just mentioned, they continue to fight their hardest and do their best to protect us. They risk their own lives just to protect our country and what is so honorable of them is they are not forced to serve our country, they just chose to. Our military works so hard so our country can be safe. Sometimes I see children in some countries on the news that have to run away and hide because they are being attacked everyday. Our country doesn't have to worry about being attacked and bombed everyday because we have such a wonderful military. Our soldiers do this for all Americans so we can live free and safe. I wish that if I had the chance I could say thank you and hug each and every person that has served for our country or someone who is serving right now. In my opinion we should thank veterans because they have risked their lives just to give us freedom. They deserve to be honored and cherished on this very special day. Veterans sacrifice everything they have, their families, their friends, just to give us the freedom to live long happy lives. Our country is so much better with our veterans because if we did not have them, what would our country be like today? Would we still have our freedom? Would we still be safe? Even though some of our veterans are no longer with us, they still deserve to be thanked. The ones that are still with us, thank you for your service and everything that you have done for our country. No matter if they stopped serving or still are, thank you!